This cable makes 1080p and lower-resolution video look great, but it can't pass through copy-protected 4K UHD content from 4K Ultra HD Blu-ray discs. 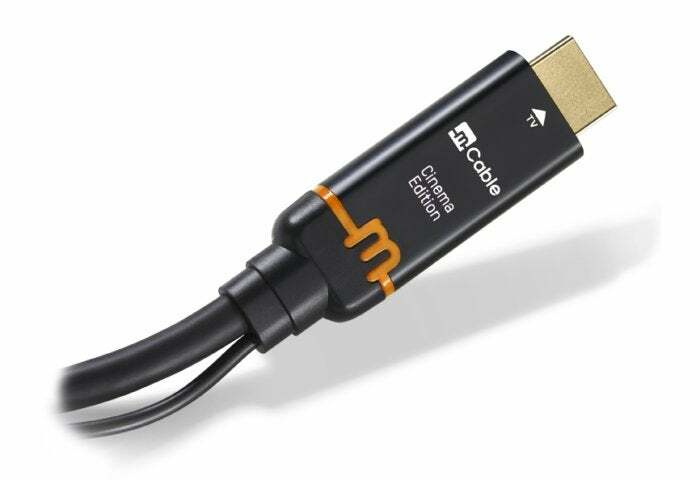 What makes this HDMI cable special? It has an embedded microprocessor that upscales and enhances 1080p or lower-resolution video to take full advantage of a 4K UHD display. It doesn’t do anything for 4K UHD (2160p) video, though, which is something I’ll go into more detail later. The mCable is available in 3-foot ($119), 6-foot ($129), and 9-foot ($139), though you’ll find it street-priced for less (Amazon sells the 6-foot version reviewed here for $99). 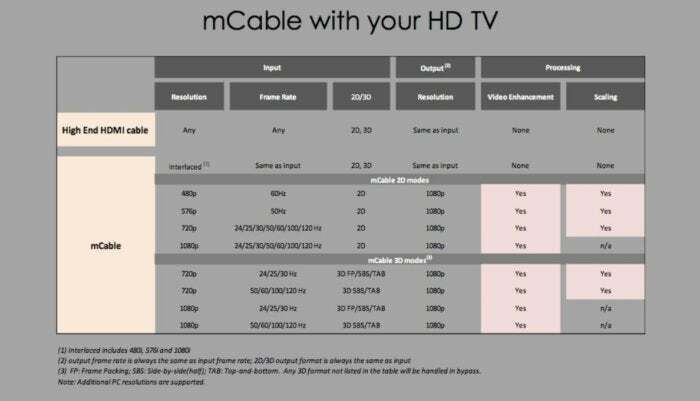 The mCable has a video upscaler/enhancer chip at the TV end..
You’ll find a captive USB cable at one end of the cable that will provide power for the microprocessor. Plug the type A connector into any standard USB port on your TV and you’ll be up and running. If your TV doesn’t have an available USB port, a USB AC power adapter will do. 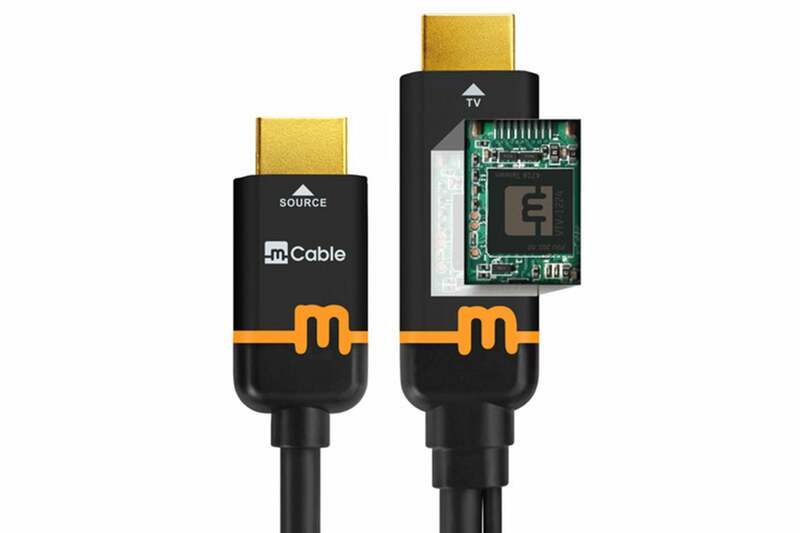 The HDMI cable ends are not interchangeable, so pay attention to the labels: The one labeled source connects to the output from your source device (DVR, set-top box, DVD or Blu-ray player, and so on), and the one labeled TV goes to the HDMI input on your TV. That’s it. The mCable draws electrical power from a USB port via the captive USB cable shown. Everything else is auto-magical, or smart, or automatic. Take your pick. There’s no app or remote, so if you don’t like the effect on any particular material, you’ll need to use a different cable. That proved to be a non-issue for me—mostly. I’ll get to that later. The mCable’s raison d’être is to process 1080P and lower-resolution video with various upscaling techniques to make it look better on 1080p and 2160p (4K UHD) televisions. Left on their own, some TVs upscale wonderfully, but some don’t. Some handle some material great, but other material… not so great. To test the mCable Cinema Edition, I broke out a variety of older format DVDs and 1080p Blu-ray discs, and I also played back the variety of files that I use for TV testing using both a Samsung UBD-9500 and a UBD-8500. UBD stands for Ultra Blu-ray Disc. I used several 4K UHD TVs to compare the results with and without the mCable Cinema Edition in the loop. I didn’t do any gaming, as Marseille offers a separate Gaming Edition cable that’s optimized for the higher refresh rates that type of content often features. I was largely impressed with the results with the majority of discs and files, though with a few files—mostly older 1930s movies—I noticed no improvement at all. As I was playing these from a USB stick in an outboard player, it might have been format related. Otherwise, 1080p, 720p, and just about everything below that looked noticeably sharper, more vivid, and with less noise. Noise removal actually somewhat undid the deliberate graininess in the first scene of the most recent version of Casino Royale. I guess you can’t have everything. This is what happens when the mCable outputs video at various resolutions to a 4K Ultra HD TV. Above is the table for what the mCable does with various resolutions of video output to a 4K UHD TV. Below is what happens when output to a 1080p TV. This table shows is what happens when the mCable outputs video in various to a Full HD (1080p) TV. I was all set to simply leave the mCable in place when I finally tossed in a copy-protected Ultra Blu-ray disc to further test the claim that 4K UHD (2160p) was simply passed through. Drat. Darn. Phooey. 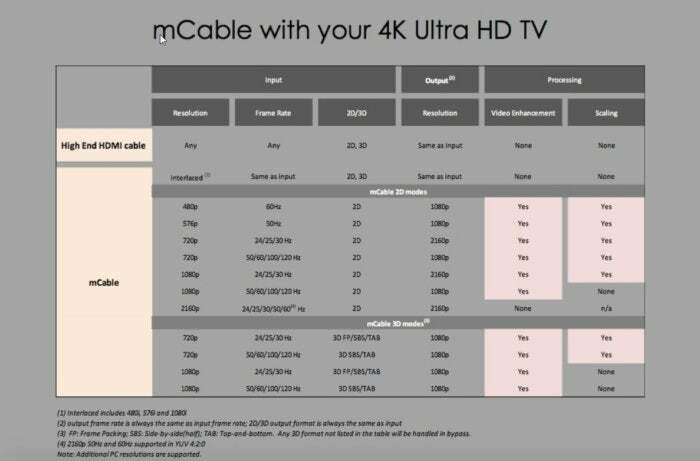 If I’d read the info carefully, (I don’t as part of usability testing), then I’d have known that the mCable with its processor is a link in the HDCP (High-bandwidth Digital Content Protection) scheme that's intended to foil pirates, and that it's limited to HDCP 1.4. The current version that 4K Ultra HD Blu-ray discs use is HDCP 2.2. By design, if any link in the signal chain doesn't support HDCP 2.2, the delivery device will automatically reduce a 2160p video stream to 1080p. If you’re using a Blu-ray or DVD player, or if you’re playing a Blu-ray disc or DVD on an Ultra HD Blu-ray player, this is a complete non-issue. 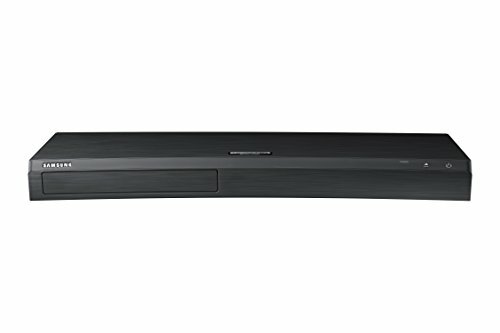 Likewise when you’re playing Ultra HD Blu-ray discs on an Ultra HD Blu-ray player with two HDMI video outputs: You’ll connect the mCable to one output, connect an HDCP 2.2-compatible cable to the second, and switch HDMI inputs on your TV accordingly. If your Ultra HD Blu-ray player is a more common model with just one HDMI output, or it has two HDMI outputs, but the second one is for audio only, you’ll also want to buy an HDCP 2.2-compatible HDMI splitter that has one input and two or more outputs. The alternative would be a cable-swapping nightmare every time you change disc type. The mCable Cinema Edition does a bang-up job of upscaling and processing 1080p and lower-resolution video. Buy one for your favorite DVD or Blu-ray player or set-top box. If you intend to use it with a single-output Ultra HD Blu-ray player, know that the absence of HDCP 2.2 support will dictate that you also buy an HDMI splitter. 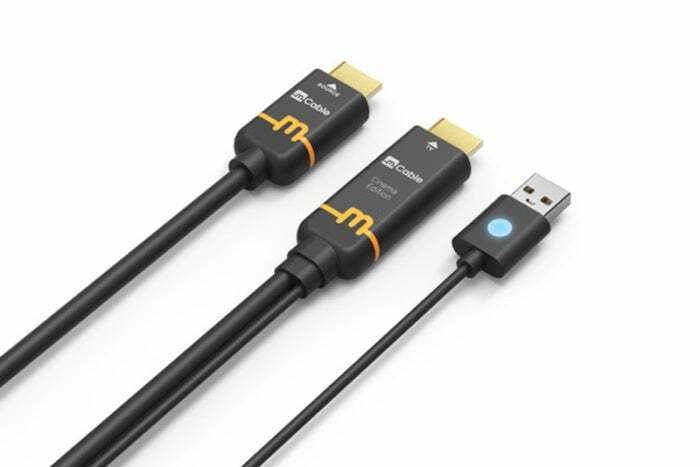 This story, "Marseille mCable Cinema Edition review: This expensive HDMI cable is mostly worth it" was originally published by TechHive. This HDMI cable has a built-in microprocessor for upscaling and improving 1080p and lower-resolution video content displayed on 4K UHD TVs. But without HDCP 2.2 support, it plays Ultra HD Blu-ray discs at only 1080p resolution.